Creativity needs to be fed and watered. 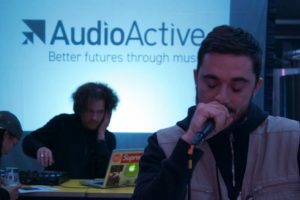 Wednesday 24th October at Brighton’s new Holler Brewery saw the launch of AudioActive’s latest initiative in its manifesto to provide a solid foundation for local grassroots talent – and it’s a venture that will do just that. Aptly christened The Movement, this powerful new enterprise aligns progressive local businesses with the vast array of young artists that keep the urban music scene burning bright, to provide regular funding that will safeguard the future for this cast of talented raconteurs. Two future-minded businesses within the Brighton community that are leading the way as early advocates of the cause are Holler and Fatto A Mano. As such, Holler’s impressive contemporary space, situated in the heart of Brighton’s thriving London Road area, was a fitting launchpad from which to set The Movement in motion. Not only did Holler’s phenomenal selection of craft beers ensure attendees were well-oiled, but Fatto A Mano’s fine artisan pizzas appeared magically throughout the night. Victuals aside, at the core of proceedings was AudioActive’s masterly cast of artists, who provided the fireworks via their own inimitable soundtrack to the city. AudioActive’s ever-present patron Rory Graham – a.k.a. Rag’n’Bone Man – was in attendance to introduce such bright lights as AA alumnus Phonetic, currently making sizeable waves in the British hip hop scene; the immensely gifted Boudicca Pepper, whose blend of hip hop and silky tones has the ability to drop jaws, and a slick sparring session from opening act Bador. “The talent performing on the night was incredible,” states Rupert Davidson, first in a growing number to sign up to The Movement. While grants and funding provide organisations such as AudioActive with much-needed revenue, initiatives such as The Movement provide the nuts and bolts. Fixed donations cover the day-to-day running costs needed to keep AudioActive’s many projects alive – from the Kustom Vibes monthly showcase and pioneering Electric Youth Ensemble through to equipment that’s vital to keep the music coming. In short, The Movement is about local businesses that are committed to making a difference within their communities and, by signing up, they are safeguarding the future for young talent. For a project so recently set in motion, it’s significant to see how many future-minded companies are already on board: BeFries, Bread & Milk, Long Story Short, Matchbox Mobile, Alter & Company and, of course, Holler Brewery and Fatto A Mano, have all pledged their continuing support. In the words of EbenFlo, this truly is ‘a community of catalysts’. Now it’s up to us to add to the spark. Those wishing to sign up to The Movement should log on to the AudioActive Supporter’s Page at http://audioactive.org.uk/our-supporters/ or contact adam@audioactive.com. Suggested monthly donations are from £50 – £500.